세비야, 스페인의 바벨 호스텔 세비야 | 호스텔월드에서 예약하세요. Si el cliente cancela, modifica la reserva 3 días antes de su llegada, o no se presenta, se le cargará la estancia completa. El establecimiento cargará el 25% del precio total de la reserva, en concepto de garantía. 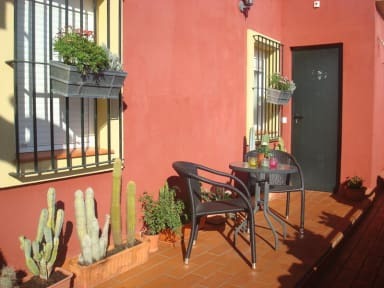 Babel Hostel Sevilla is a cozy and friendly hostel located in the center of Seville, in the famous Alameda de Hercules. The hostel is set in a typical Sevillian house, with a large central patio and charming terrace. The property has 24 hour front desk. For your comfort, the hostel is well-furnished and decorated to make your stay pleasant in the beautiful city of Seville. 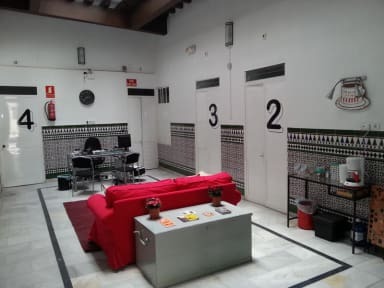 Babel Hostel Sevilla, is very located in the city center of Sevilla, close to Alameda de Hercules, one of the best entertainment areas of the city, where you will find bars, cafes and restaurants of all kinds. The Hostel offers private rooms and dorms. Some of our rooms have private bathrooms and hot / cold air conditioning. We have kitchen and TV room for guest use. In the reception area you can enjoy free coffee and tea, while connecting to WI-FI. All rooms have linen included. Towels for the double rooms are also included in the price. In the shared rooms the price is 1 €. If you arrive late, please advise the property before your arrival. Payment types accepted at this property: credit card, debit card and cash. The property may pre-authorize your card before arrival. The best part of this hostel was a kitchen. About other things, it was just normal like other hostels.